PMI (Post-Merger Integrations) represent a project domain characterized by non-obvious priorities and high-impact pitfalls. Consequently, PMI is more experience-correlated than other types of M&A projects – and quite different from the "financial analysis" parts of a regular M&A process. In order to be successful, post-merger integrations need to focus on a balanced set of priorities – from hard-core synergies to the practical combining of two different corporate cultures. This "hard-soft" approach is critical in order to reduce acquisition risk. Failed acquisitions or mergers are typically explained by a lack of integration focus – with weak attention to organization and cultural issues as the most fundamental causes of failure. Why? Synergy capture is an obvious focus area (but not a very challenging one to solve), requiring mostly an analytical skill-set. It is more difficult to handle the increased intricate issues related to organizational resistance and "us vs. them" attitudes. Consequently, the usual tendency is to under-prioritize these areas when compared to synergy projects. But a balancing act is critical. 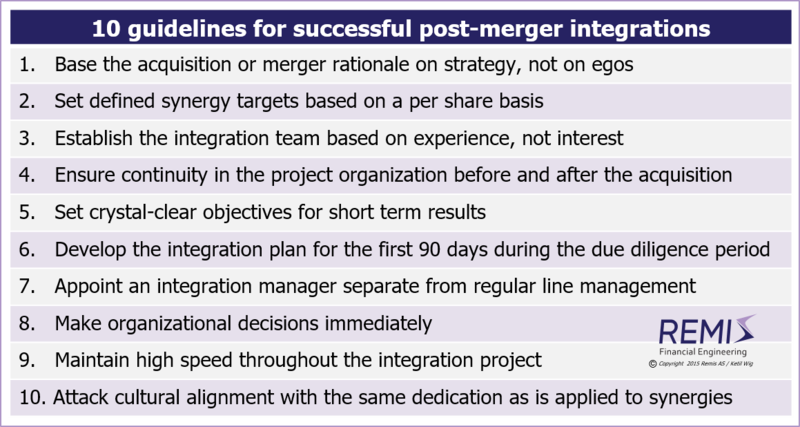 The following illistration is taken from White Paper #1 which introduces 10 steps to a succesful post-merger integration project. For a full web version of this white paper, see the article: On Synergies and Poor Judgement. A shorter web version is provided in this LinkedIn article. In Scandinavia, a balanced approach to integrations is of particular importance, since organizations are characterized by large degrees of autonomy and delegated decision making – and because employees require and demand attention to a broader set of issues than those typically found when executing mergers in other cultures. Also read the separate articles on Strategy Implementation and the Lack of Results, on Developing High Quality Business Models; on Strategy and the Proper Use of M&A Tools, on Buy-Side M&A, on Sell-Side M&A, on Financial vs. Industrial Ownership, on Equity Based Financing of Start-ups, and on M&A Process Management. See Download Center: White Paper #1: Post-Merger Integrations - About Synergies and Poor Judgment; White Paper #3: Strategy and Implementation - and the Lack of Results; White Paper #5: Buy-Side M&A (mergers and acquisitions); White Paper #6: Sell-Side M&A (divestitures, trade-sales and mergers); White Paper #7: Should You Choose Financial or Industrial Investors/Owners? ; or White Paper #9: A 15 Step Recipe for Developing Your High-Quality Business Model. Remis AS and Ketil Wig offers advisory and consulting services to foreign owners, handling key priorities related to investments and operational assets in Norway. Typically post-merger integration assignments are related to handling a bolt-on acquisition in Norway or Scandinavia; or the merger of two Norwegian entities as the consequence of an international acquisition or merger. 10+ post-merger integrations (PMI) projects across Europe. Focus on merger situations requiring speed and precision balanced with synergy capture, profit improvement, strategy alignment and attention to cultural sensitivity. Business unit core size of US$100-1,000M.